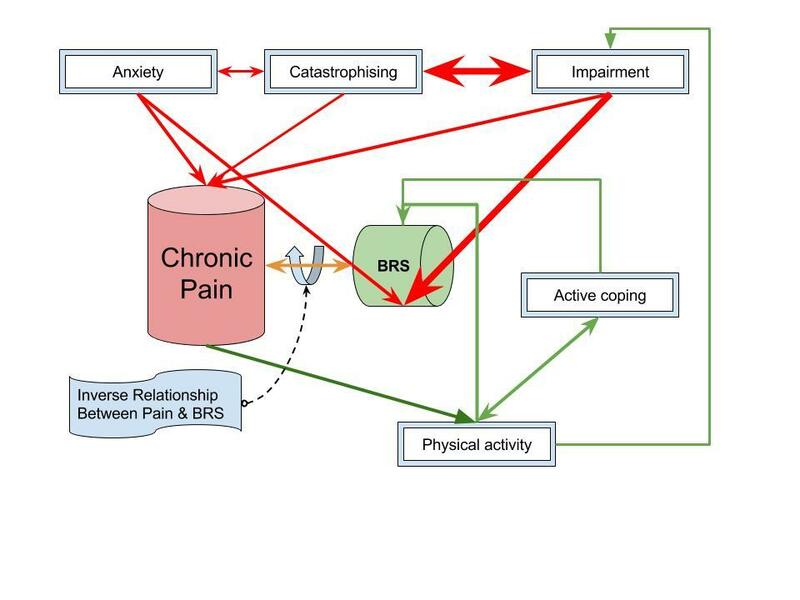 Here is the factors that we are using for chronic pain. Could you ellaborate what/how you are measuring/scoring factors like this? The top 3 and are standardized questionnaires. BRS requires continuous blood pressure and EKG. Active coping is also based on a personality test confirmed by interview and the last one is also a questionnaire, but I would prefer to replace with an activity tracker. One point on the mood/emotional subcomponents - With emotional, it might be worth considering the different types of emotional satisfaction one can have such as eudaimonic (e.g., living the good life - related to senses of autonomy, relatedness and competence) and hedonic which is like your pain:pleasure ratio. Beyond mood ratings, another thing you could track is text content to get a fuller picture about what kinds of emotions are experienced, activities involved and other types of language (e.g., moments of insight, breadth of vocabulary, can try this tool -> LIWC). At first read, you post made me think of Quelth. It is limitted mostly to physical health; though they have begun expanding it to include more mental and social health factors too. My basic thesis is that there are three components to overall health (or "the good life") - body, mind, & spirit. For the purposes of making measurements, i.e. quantifying human health, I can see the logic in using body, mind and spirit. But this is a westernised view of Homo Sapiens. In eastern traditions, the picture is different. Physical, subtle, causal and other bodies all feature in Eastern Mysticism. While it is relatively easy to make measurements at the physical level, it becomes progressively more difficult to quantify the other levels. I guess an holistic or integrated view is an alternative starting point. There is, after all, a growing move towards the mind-body approach to medicine and there are many exponents of this. It doesn't stop us quantifying things at the physical level as these often reflect what is going on with our emotions, for example.